We already know windows 10 mobile will be running on phones and small tablets. Yet we haven't seen it in action. 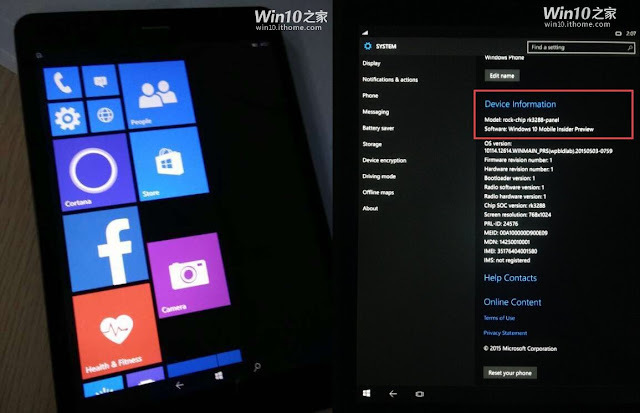 But now what appears to a 10 " ARM tablet has been found running Windows 10 mobile. The tablet has a 10" screen with 1024x768 resolution, Rockchip RK3288 which is based on ARM cortex A-17 design, having a 1.5GB RAM. The UI looks like a club between Continuum and regular phone UI. Microsoft said there will be some kind of update coming to existing ARM based tablets. Is this the the software that is going to come to ARM devices? If yes how they are going to get it? So any OEM's going to make ARM tablets running Windows 10 Mobile? At this point we can only say this image can mean may things. So lest wait and see.